If you have read my bio you know that I lived on the Jersey Shore for many years. It took a direct hit from hurricane Sandy a short time ago. I have many family members and friends that are struggling with the devastation that has befallen the region. My heart goes out to them all. I also have friends that work in the arts there. They are struggling as well. Even in good times most artists are never far from the financial edge. Day jobs, second jobs, part-time jobs, and odd jobs abound. I would like to provide an avenue for you to help them survive this hard time. 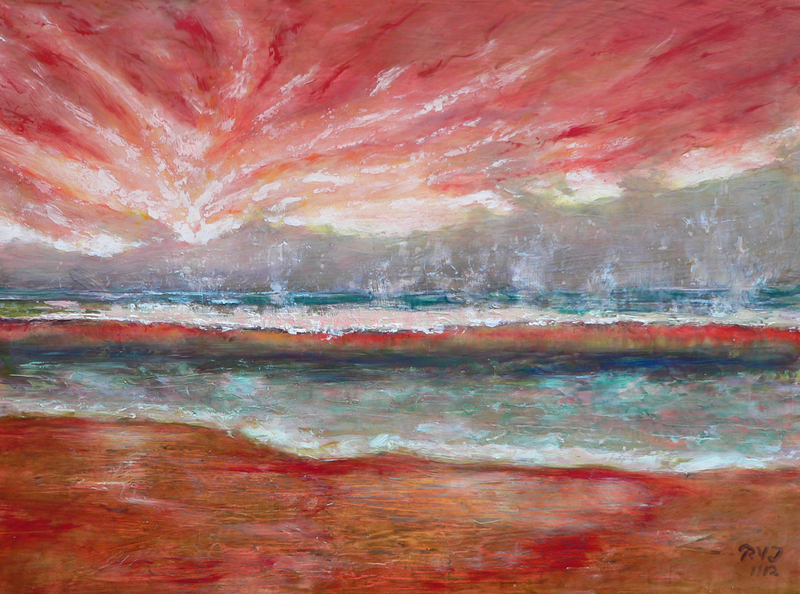 I will donate all proceeds from the sale of this work Red Dawn to struggling artists on the Jersey Shore. Also, until years end, 50% of the profit from any work that I sell on my websight RVJart.com will go to my fellow New Jersey artists as well. Help me to help them. This painting of the Jersey Shore was underway before hurricane Sandy made landfall. Its ominous tone was prophetic. To see some of the damage you can go to this film that my nephew Jesse made. He lives in Point Pleasant, New Jersey and is directly impacted. Great and generous idea, Roger! You are so thoughtful, Roger. I shared this link on my Facebook page. Good luck and thank you for being who you are. Thank you all, if you click on the title of the work in the text it will take you to my web sight page to buy it. I did not want to get into a bidding situation. Also I wanted to carry the relief effort to the end of the year so that if you wanted to do some holiday shopping there is still time to help. BTW just realized what a great job you did on the title for this post. The power of the comma.